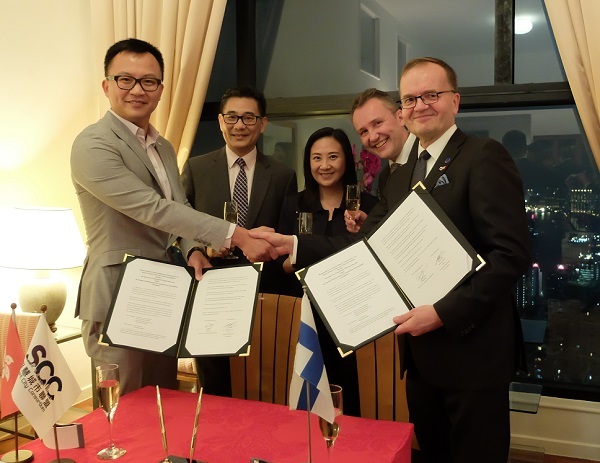 A Memorandum of Understanding (MoU) has been signed between the Finnish Funding Agency for Innovation (Tekes) and the Smart City Consortium (SCC) of Hong Kong. The purpose of the MoU is to enhance cooperation in the sector of smart cities and urban development. Pekka Soini, Director General of Tekes, and Eric Yeung, President of the SCC of Hong Kong, signed the MoU on the 14th of November 2017. The MoU is based on the common understanding between the Parties that new smart city -solutions and innovations are needed in order to create future success in urban development. The Parties plan on developing new business concepts and carrying out comprehensive, stable and long-term collaboration in the areas of e.g. smart transportation, smart buildings, ICT, smart energy, e-health and smart security. "The principles of mutual benefit and win-win cooperation are in the heart of the MoU. Finland is a country that has always been able to come up with world-class innovations in the fields of technology, education and social well-being. We are confident that our future collaborations will be beneficial to both Finland and Hong Kong. This also offers an excellent opportunity for Finnish companies and research organizations to enter into the very promising and dynamic Hong Kongese market", says Pekka Soini, Director General of Tekes. The Parties wish to encourage collaborative projects in the aforementioned possible areas of collaboration, strengthen industrial participation in the innovation process, collaborate in funding of cooperative projects of Finnish and Hong Kongese organizations, encourage exchange of knowledge and accelerate bilateral cooperation and development of new service and business concepts in these potential areas of cooperation. Tekes is the most important publicly funded expert organisation for financing research, development and innovation in Finland. Tekes boosts wide-ranging innovation activities in research communities, industry and service sectors. Hong Kong Smart City Consortium (SCC) is formed by a group of professionals from different corporations and organizations to provide opinions and suggestions to the Government for formulating related policies and standards in the development of Hong Kong as a world-class smart city. They encourage worldwide collaboration with different stakeholders to create the right ecosystem which fosters innovation and sustainable economic growth for Hong Kong. The Consulate General of Finland promotes Finnish interests in Hong Kong and Macau by catalyzing cooperation of relevant actors.